If gold is entering a new bull market then it’s a great time to get in. Technical evidence is mounting, big volume is coming into gold mining ETFs and they are leading the market. 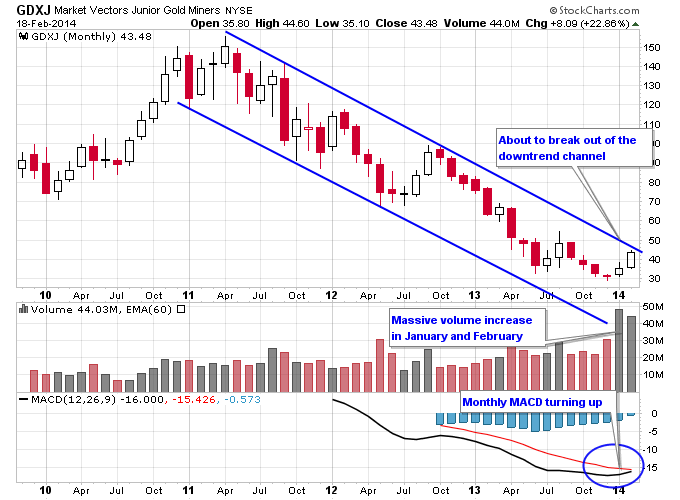 Take a look at the monthly volume on the Junior Gold Miners ETF GDXJ. After a huge volume increase in January, the buying pressure hasn’t subsided as February is set to smash the record volume set just last month. GDXJ is also pressing up against downtrend resistance and the monthly MACD is turning higher, setting up a potential breakout. As the gold sector is leading the market this year, trading desks around the world are probably scrambling to figure out what to do about it. Wall Street exited gold en masse in 2013 and formed a herd against gold declaring it a short for 2014. Now with GDXJ up over 40% this year and gold stocks reaping big gains they have to decide when and how they want to get back into the gold sector. Look for opinions on gold to start changing from the big banks as they won’t want to stay bearish on gold forever if it’s price continues to rise. Some people might argue that Wall Street has such a huge information advantage over the individual investor that they can outsmart and out maneuver the individual investor whenever they choose. But this information advantage goes up against two distinct advantages the individual investor has over a big bank: speed and contrarian thinking. Individual investors don’t have to wait for confirmation from clients or from other members of a firm on investing decisions. They can simply deploy funds however they choose, without the need to consult a hierarchy of decision makers on how to enter and exit the market. This freedom allows individual investors to trade at whatever speed and conviction level they want, which is a huge advantage when it comes to getting onboard new trends as early as possible. The other advantage the individual investor has is trading outside of the groupthink that tends to invade Wall Street. Even with their armies of analysts and mountains of information, Wall Street still falls prey to what happens to humans whenever they form groups. They start thinking like a herd. And as anyone that has studied markets knows herd thinking is what ultimately ends long term trends and starts new ones. So while Wall Street takes its time to wake up to a possible new uptrend in gold, the individual investor can use their speed and independence to their advantage and get positioned. Getting positioned early in a new bull market is hard enough. Taking a contrarian view, and waiting for a market to transition into a new uptrend takes patience and skill. But perhaps a more daunting challenge is what to do after getting positioned in a new uptrend and seeing a profitable trade start to form. Let’s break down what Livermore is saying here and see what we can learn (with emphasis on what is highlighted in bold). He starts by basically saying of all the time he’s spent on Wall Street, with the millions of dollars he’s won and lost, this is one of the most important lessons he learned. He only made the big money by sitting tight and letting a big trade form, and not by trading in and out of the markets all the time. One of my favorite parts of this quote is when he says “Got that?” as if to say “Hey knucklehead! This is important so you better listen up!”. Livermore is trying to pass on knowledge here, and help the reader learn from his mistakes. Livermore states that not only was sitting tight one of the most important things he learned, but it was also one of the hardest things he learned. It took him years of success and failure to figure out how important this was. But he says once he firmly grasped the idea of sitting tight in big trades, it allowed him to make the big money.